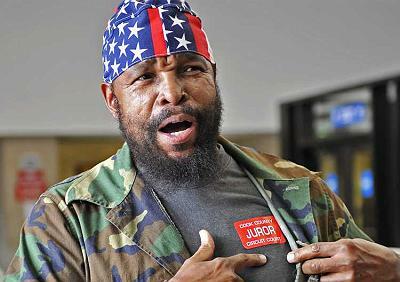 As I’ve mentioned before, one of the most popular searches that leads people to this site is something like “how to get out of jury duty,” and here’s the latest idea for that — be Mr. T.
T, born “Laurence Tureaud” but likely not called that in some time, was called for jury duty on Monday at Cook County Criminal Court in Chicago. He spent about five hours in court during voir dire for a criminal case, but ultimately was not chosen. Asia Cartwright and her sister Temeka said they recognized T right away and got their pictures taken with him. Asia said she didn’t know why T had not been chosen for the jury, but it might have something to do with the fact that their mom was the defendant and they had posed for pictures with a potential juror. Or maybe it was something to do with T’s reputation for pitying fools. What are the odds that Mr. T would not end up as the foreperson?